FSU graduate, Jared Tirone volunteering in Mali from 2009-2011. Tirone earned a Master’s Degree in International and Multicultural Education. Florida State University will launch a new program this fall that will prepare students to volunteer in the Peace Corps or work abroad. The Peace Corps Prep program will help undergraduate students explore and discover the Peace Corps service opportunities that interest them and the skills they need to be a competitive applicant for those positions. Through a partnership with the College of Education, FSU’s Peace Corps Prep will assist new graduates through the application process to the Peace Corps Education volunteer program. The Peace Corps established the preparation program in 2007 to support universities’ efforts to provide substantive, globally focused experiences for their students. There are more than 75 institutions of higher education nationwide that offer the curriculum. “FSU is among the top 25 universities in the United States supplying volunteers to the Peace Corps, and this program will help to expand that number,” Boyle said. 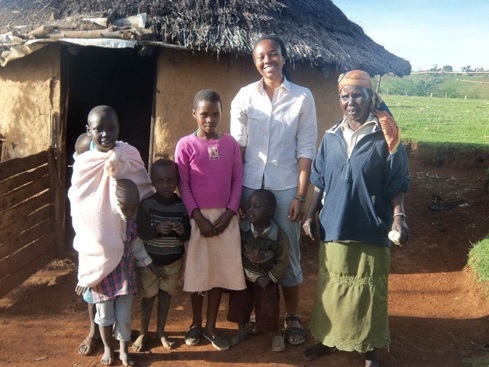 FSU Doctoral Candidate Wykia Macon, volunteered in Kenya from 2011- 2013. Peace Corps Prep students combine targeted coursework with hands-on experience, building the competencies needed to be strong Peace Corps volunteers or to live and work abroad. Upon successful completion, students will receive a signed certificate from the Peace Corps. Since 1961, FSU has produced 856 volunteers, with 38 currently serving today. Peace Corp Prep at FSU, administered by FSU’s Learning Systems Institute, is currently accepting applications for Fall 2018. For questions or to receive application forms contact Helen Boyle at hboyle@lsi.fsu.edu or FSU PC Recruiter Jared Tirone at (850) 645-0245 or at fsupeacecorps@gmail.com. For more information, click here.